If you prefer reading off line, just right click and ‘Save Link As’ to save it to your computer. I hope you find it interesting, entertaining or helpful. In August of 2011, I published an e-book, featuring contributions from 31 preeminent SEOs, CROs, Internet marketers, copywriters, developers and designers. The result was nearly 500 responses to pressing questions we’ve all had at some point. 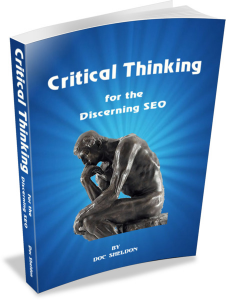 But Critical Thinking for the Discerning SEO isn’t a what-to-think book… it’s a how-to-think book. Teach a man to fish, you know? Since it doesn’t try to teach you what to think, the wisdom shared by these folks is timeless. No algorithm update or new marketing focus by the search engines will render it outdated. No new fad or emerging technology will make their advice obsolete. it’s all geared toward sustainable SEO and marketing techniques. All sales during the first several months went 100% to charity, but after two years, I decided it’s time to just share it freely. So I’ve published it here on Intrinsic Value SEO. If you’d prefer to read it off-line, you can download it in Kindle format from Amazon for under $3. For those that would like it, after all the chapters have been published, I’ll be offering a download of the entire book. Meanwhile, I’ll share the Foreword here. The chapters will be coming out on our blog. One night, I was thinking to myself about how many people spend tremendous amounts of time poring through dozens of blog posts and forum threads in an effort to see what the “gurus” say about this, that and the other. And about how many of them end up being either misled or left with more questions than answers. I remember that well, because when I first set out to learn all I could about SEO some eight years ago, that’s the way I did it. Sure, I also searched for tutorials and tips, and even bought a couple of books. But my main thrust was on reading the day to day postings of some of the most prominent SEO bloggers, and following the posts of prominent practitioners on various forums. Now, I can’t help but laugh at myself, of course. I realize now that what I did was far from efficient. In fact, it often proved to be far from reliable, too. Something like checking restrooms at all the gas stations in town, in hopes of finding a few pearls of wisdom scrawled on the stall doors. Like everyone else, they’re human, with all the quirks and idiosyncrasies that implies (for the record, opinionated can be considered an idiosyncrasy). On numerous occasions, I’ve set out to find the answer to a particular question, only to find that opinions were very divided on the issue. Of course, it’s not uncommon for both sides of an argument to have some merit. But I found that all too often, one or both sides was unwilling or unable to see the merit in the other. In fact, disagreement often seemed to lead to attacks on the competence of one or both sides. Which, of course, usually left me right back where I’d started. Now, that’s not all bad. If you’re inclined to be open-minded about something, then hearing all the arguments at least gives you a leg up. You may have started out totally ignorant on the topic, but after reading several pages of forum comments and half a dozen blogs, you’ll at least have the question better defined. Eventually, I’d find the answer I needed, even though it usually meant testing for myself to see which argument held the most water. And in that process, repeated time after time, I learned something else, too. You can’t believe everything you hear, regardless of how well-known or respected the source. So I decided that a book to help out the folks that are trying to get some of those same answers might be helpful. But I’m sixty-one years old, and it occurred to me that a book covering all the ins and outs of internet marketing, SEO, copywriting and development just might take longer to write than I’ve got left. And that’s when this idea really began to take shape. To learn to fish, one needs to learn how fish think. There are many different fish in the Internet Sea. And just as many different ways to catch them. You can start with Chapter One here. Who has Time to Waste? Which is Your Font of Wisdom? I’d also like to once again thank Nichola Stott for reviewing Critical Thinking on Search Engine Watch and Claire Carlile for her review on State of Search. Both were flattering, while pointing out some valid areas that could bear some improvement the next time around.